No guitarist is exempt from the all-important warmup before a show - not even those as talented as Newton Faulkner. So in video lesson, Total Guitar shows you Newton's own warm-up exercise (Example 2, tabbed here on page 2), which he describes as "something for the head, as well as the fingers". Don't worry, this is more than just a picking exercise. Newton's routine features a distinct melody; use your ear to try and pick it out. As a general rule, the highest notes provide the strongest melody, so listen out for those. TG has also 'Newtonised' this warm-up exercise for you (Example 3, tabbed here on page 3), complete with percussive taps. The first strike is the 'bass drum' effect that Newton gets by tapping the heel of his hand just above the soundhole. Beats 2 and 4 of the bar are a 'snare' effect, created by tapping your fingertips just below the soundhole. If you're feeling adventurous, try experimenting with a combination of Newton's percussive strikes. 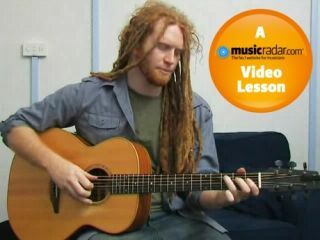 For more information, visit Newton Faulkner's official website. We've included two of these percussive strikes in our 'Newtonised' tune. Try adding one or two other strikes if you're feeling adventurous. Here is Newton's warm-up, as demonstrated on the video. To maintain his co-ordination, Newton starts from a slow tempo and gradually builds pace to maximum speed. Building speed gradually is a great way to warm up. This is our 'Newtonised' version of the warm-up, featuring bass and snare-style hits on the guitar top. Use this as a starting point for your own ideas and try including other percussive hits for variation.